Poire Belle Helene is a French "clafoutis"-type of desert, with pears topped with dark chocolate sauce. A clafoutis is a French dessert-cake, from a region in France called the Limousin. It is eaten hot or cold, and is made of eggs, flour, milk, fruits and sugar. 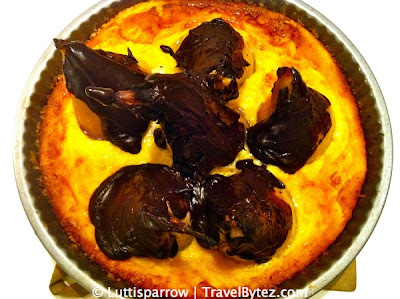 The traditional clafoutis is baked with seedless cherries, but this is one variant of the cake with pears. I attempted to bake one myself, and I found that liked it very much. The only thing to remember is to make the chocolate sauce at the very last minute, otherwise it hardens (see above picture) and does not taste exactly like you want it to be (too bitter). The cake itself although tasty, can quite filling and heavy, so it's best to have it for tea or after a light meal. Peel the pears and take of the seeds from the inside to keep the whole pear. Cut the lemon in two and rub it on the pears. Put butter and sugar in the mold, and place the pears inside. In a salad bowl, pour the corn starch, the sugars (vanilla and the fine one) and the salt. Add all the eggs (whole and yolk). Mix a little bit after each pouring to blend everything together. Then, add the fresh creme. To obtain a liquid paste, add the milk and blend everything for 10 minutes. Pour the paste in the mold around the pears. Bake it in the oven for approximately 35 to 40 minutes. Then at the last minute, prepare the chocolate sauce. Boil the milk and the fresh creme and add off the fire, all the other ingredients left and mix it all. When the baking of the clafoutis is finished (after 35-40 minutes) and you want to serve, pour the hot chocolate sauce on the pears and serve it warm. Well here was the recipe for the French clafoutis desert, I hope you will enjoy it. Happy tasting and do not hesitate to leave comments and/or feedback. This looks absolutely delicious. Curiously, how do you cut the seeds out of a pear to keep it whole? I've always had to cut around the core, like an apple. I've never heard of being able to core a pear and keep it whole. Thank you ;) Yes it is really good. Actually, I used a special tool, made to extract seeds. You start from the bottom of the pear, and core it upwards. It is not that easy but not impossible... You can finish it by scraping the inside with a knife. If you don't have the tool, you can try to do it with a knife. And if you still don't manage doing it you can still slice the pear and pour the paste on top of it.